KUMKUM BHAGYA Update: Aliya and Tanu realise they are dealing with Pragya and not Munni! Aliya and Tanu realise they are dealing with Pragya and not Munni! Poorab asks Trisha to be truthful why she went to Aalya’s room. There, in the room Aaliya comes her wrist thinking about Poorab and Trisha’s intimacy. Tannu comes to save her, though her wrist was injured. Trisha finally shares with Poorab that Pragya was there with her in the room. She was hidden from Aaliya. She tells Poorab Pragya was looking for papers, Aaliya has planned to get the property named after herself. They searched for the file all around her room but couldn’t find it. Pragya is really tensed about it. Bangkok soon. Pragya tries to speak to Abhi that she is really afraid, she was tensed. A manager comes to call Abhi right then, and he cuts the call. Poorab and Trisha comes to Pragya’s room then. Trisha apologizes Pragya for not being able to lie to Poorab. Poorab complains about not sharing her problem with him. She has always trusted him, but why she hid the matter from him now. Pragya says she didn’t know how to share the situation. Poorab says Aaliya took the signatures from her, is there something else that Pragya didn’t share. Trisha takes their attention to papers. Pragya says she heard Aaliya herself that she has kept the papers, then where they went. Aaliya didn’t even go out of the house tomorrow. Aaliya was getting ready. Tannu comes to ask her about the whereabouts of the papers. Aaliya says she kept them with an old trustworthy relation to secure them. Raaj was waiting in the room. Mitali brings the file to him and asks what’s in it. Raaj says it contains papers of Abhi’s property. Mitali wasn’t ready to believe. Tannu was shocked to hear Raaj was their side. Aaliya says when good people are sent to jail, they turn evil. Raaj also turned their side a long time ago. They go out of the room and watches Poorab and Disha with Pragya. Poorab and Disha get aside from Pragya consciously, Aaliya points at Pragya to go to them. Poorab discusses they have nothing in hands. Disha spots a file on the table. Pragya recognizes the file and wonders what its doing there. Poorab wonders how they must steal the file. On the table, Raaj thinks till the evening, he will also have a kingdom over the house. Aaliya comes to Mitali and wish them all a good morning. They point someone will get out this house by tonight. Dadi forbids them to eat up her brain. Pragya goes to indulge them with some talk, meanwhile Poorab and Disha get the file. Tannu asks Pragya to join them for breakfast. She murmurs that it’s the last day today, she doesn’t want to see her face from tomorrow as it reminds her of deceased Pragya. PRECAP: Poorab and Disha were worried that everything would be ruined if Aaliya is successful in registration of property. Rishab comes to Preita. She hands him a bundle of money and assures the kid that no one will take the pack from him. Rishab asks if she has so much money. Preita accepts she has no money at all but it was important to feed him. She discuss this bundle was given to her by a cricketer. Rishab asks which cricketer, but Preita’s bus arrives. Rishab. The doctor apologizes Preita as the vacancy has been filled already. At home, Shistri was practicing modeling. Sarla comes to ask her to ask for breakfast. Shistri tells Sarla she wants to be a model, and shows her Tannu’s posters pasted all across the room. Sarla watches Tannu’s posters and boils out of anger, she tears the posters and says Shistri can no longer stay in this house. Dadi comes to calm Sarla then Shistri. Shistri takes the glass of Dadi’s drink and gulps it, then feels relaxed and agrees to stay here for a while. Preita was coming out of the hospital after rejection from a various hospitals. She watches Karan having an argument with a girl, he leaves the girl halfway and drives away. Preita comes to the girl and asks Sania if Karan misbehaved with her, what it was about. Sania explains he wanted to force her but she didn’t let her. Preita says they must teach him a lesson and takes Sania. In the police station, Sania was reluctant to file a complaint against Karan. Preita insists no matter how huge or rich a celebrity be, he must be taught a lesson and prevent him from doing this to others. Preita comes to inspector and asks to file a complaint against Karan Lutra. Preita compels Sania not to hesitate. In the practice court, Karan comes to book his time with two girls who bet for his game. Later, Karan was with the two of them. One of them was upset, while the other happy. Karan receives a phone call. The girls argue each other. Karan promises to reach and takes a leave from girls as he has been called at police station. Karan arrives at police station. The inspectors there ask to take a selfie with him. The lady inspector arrives and informs Karan strictly about the complaint against him. A girl has filed the report of molestation against him. She points towards the girl. Karan could see Preita speaking to Sania. PRECAP: Abhi tells Preita about getting her a job and sends her to meet him. She only has to take care of his Dadi. Preita calls Abhi an angel. Abhi says his friend direly needs a physiotherapist. 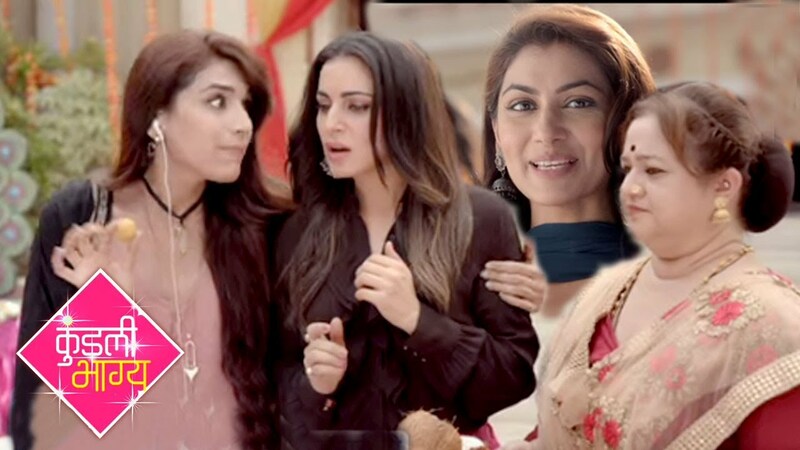 Gossip Mail: KUMKUM BHAGYA Update: Aliya and Tanu realise they are dealing with Pragya and not Munni!